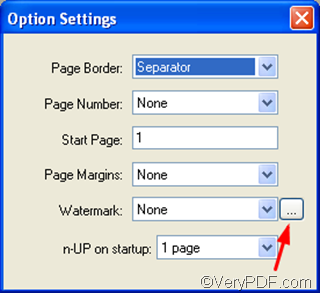 ← How to convert pcl to pdf? How to add a translucent watermark on each page of my document? 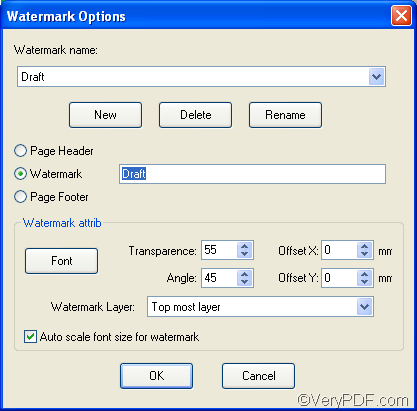 For the sake of security, sometimes, users may need to add translucent watermarks on their documents. 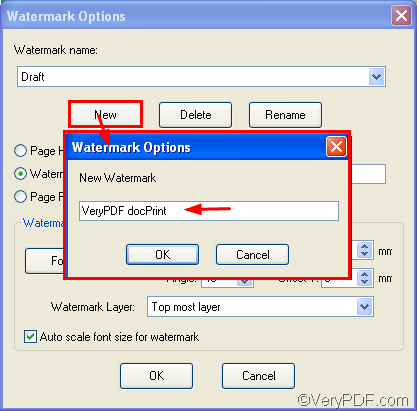 The print preview application within VeryPDF docPrint allows you to add a watermark on each page of your document. 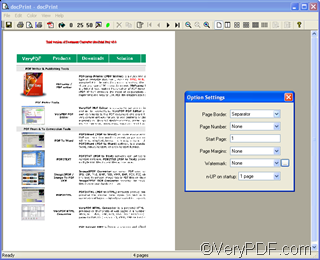 docPrint supports you to add a watermark with an optional transparent degree on each page of the document, avoiding covering Watermarks Headers and Footers: Watermark, header and footer option allows documents to be marked with specific text other pictures or photographs in the page. 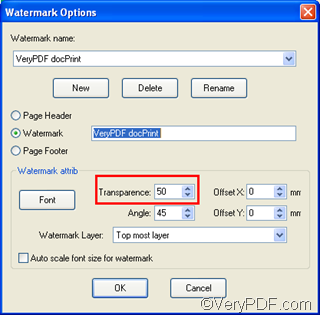 The following part of the article would like to show you how to add a translucent watermark on each page of your document. 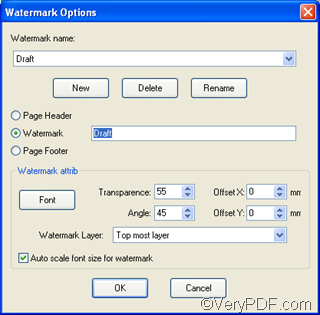 First of all, you should open the selected document you want to add watermark, for instance, a PDF file. Second, run the docPrint application. You should press Ctrl+P to run the Print dialog box > select docPrint as the printer and press OK in the Print dialog box. 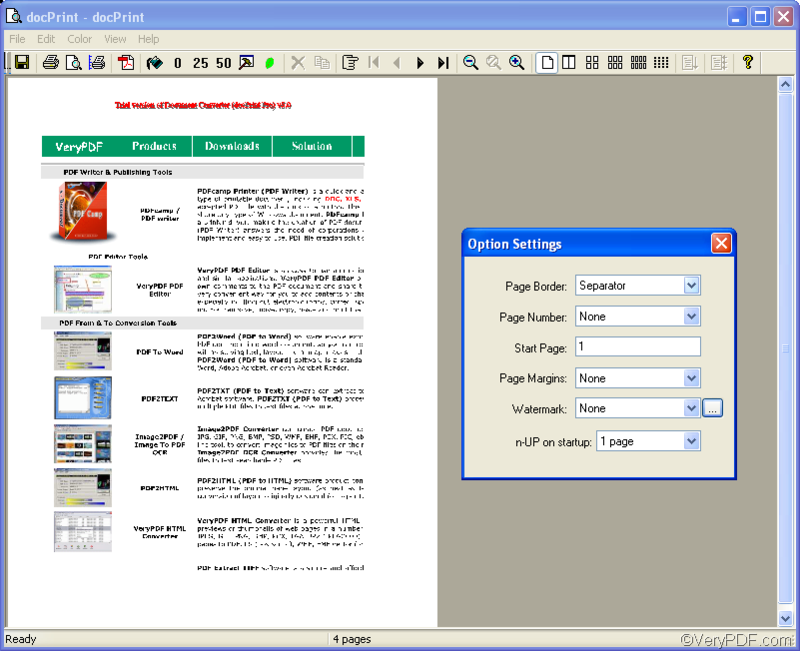 Then, usually two dialog boxes are supposed to appear on your computer screen at the same time: The docPrint dialog box and the Setting Option dialog box. 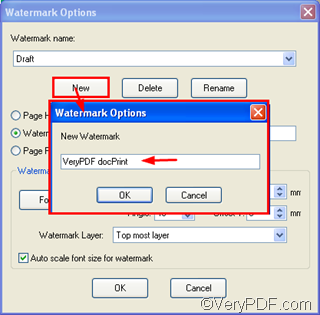 Thirdly, click the little button next to the Watermark combo box to open the Watermark Options dialog box as illustrated below, and add a watermark, for instance “VeryPDF docPrint ”. Fourthly, set the watermark as translucent. You should select the proper degree of transparence in the Transparence combo box, for example, 40. The little the number, the lighter the color of the watermark. The following two watermarks show you the effect of transparence. The transparence of the first one is 100, the transparence of the latter one is 45. To be more briefly, if you want to add a translucent watermark on each page of the document, only two steps are required. The first step is to add a watermark, the second step is to change the transparence of the watermark. Would you tell me how to convert Word to TIFF image files? How can I create high quality DIB files from a Word document? How can I create high quality MNG files from a Word document? How to convert MS Office Excel documents of XLS to JBIG? This entry was posted in docPrint Pro and tagged VeryPDF docPrint. Bookmark the permalink.